So as you read this post (if scheduling works correctly this time) I’m probably a long ways away. Well, not quite yet, I suppose, but I’m in the car on the way to a long ways away. This is because, after a long wait, I’m going back to England! For the most part, this is a business trip – I’ve had research accepted to a conference and I’m presenting it as well as attending some of the rest of the conference. I’m also excited that I get to meet up with many of the friends I had while studying abroad, AND I get to meet a friend who lives in the internet! I’m very excited about all of this, but sad as well that it means I must leave you all alone for a whole week. When the magician Jocelyn Brandon Hope died he bequeathed Melstone House to his grandson Andrew. He also left his ‘field of care’: an area of strangeness surrounding the land around the house, whose boundary Andrew must walk in order to preserve its power. Andrew had always loved the house, but he finds owning it a lot more complicated, aside from all the magic. There is Mrs Stock, the tyrannical housekeeper who won’t let him move the furniture and punishes him with her terrible cooking. Just as bad is the obsessive gardener who will only grow giant inedible vegetables. To add to his troubles, twelve year old orphan Aidan Cain suddenly arrives on the doorstep begging protection from magical stalkers, and Andrew’s sinister rich neighbour, Mr Brown, begins to encroach on the ‘field of care’. The one compensation is the gardener’s beautiful niece, Stashe. Things become stranger and stranger until all is made clear with the help of the enchanted glass itself. My Review: I’ve probably already said this, but Diana Wynne Jones is one of my favorite authors ever. When she died earlier this year, we lost one of the greatest minds that I have ever admired. Enchanted Glass is the last book she ever wrote, and while I’m grateful to have it, I will be feeling the loss of her new works for many years to come. One of the things I’ve always admired about Diana is how she always builds a completely new, beautiful world with each work. They all feel as if they might be related, because her style is so distinctive, but they’re all fresh and new, each with its own rules and its own quirks. Enchanted Glass is no exception. The rural England setting makes for a charming mixture of modern day with quaint old-fashioned small town, allowing for an entirely new brand of magical mischief. Though the plot was slightly predictable – I had worked out who everyone was and who would win in the end by about halfway through – it was the reading experience itself that made this so truly enjoyable for me. Picking up any of Diana’s books, for me, is like reacquainting myself with an old friend that you haven’t spoken to for years. True, the cover may have changed and the plot may have lost (or gained) a few parallel universes, but that spark that created the original friendship is still there, waiting for you to rediscover it. My Review: One of the things I really love about summer is the amount of reading I get done. During the summer I actually have time to spend on my obsessions, so typical speed for me is approximately a book a day. While this is a wonderful feeling while I’m doing it, it certainly makes for a major review backlog! Sorry! The first thing that struck me about the novel is that it is so different from Diaries. I had trouble telling it was the same author because everything about the book was so much darker than I was expecting! The Hispanic flavor and the gothic setting added interesting touches, blending several mythologies into one very interesting story. But I think my favorite thing about the book was John. He (in my imagination at least) is so gorgeous! He is wonderfully mysterious and delightfully flawed. He does have his moments of evil, and they are terrifying, but for the most part he’s just a tormented sould forced into a job he doesn’t want. I felt so bad for him, all I wanted to do was help. Honestly if I were Pierce, I might have gone with him in the first place instead of trying to escape. Bottom line: This is a fun book that is a must read for anyone who likes mythology. I will be eagerly awaiting the second book – I need more! Yet another Media Monday! I may start making this a regular meme, what do you guys think? That’s right Harry Potter and the Deathly Hallows Part 2! This isn’t really going to be a review. I think the work really defies reviewing, because of the amount of emotional baggage that comes with it for so many of us. I went into it not knowing what to expect. I am very good at separating books from movies, and so I wasn’t as worried as some about what they’d get right and what they’d miss. Even so, I’ve invested so much time and love into this series (both books and movies) that I still had some expectations. The very first thing that came out of my mouth after the credits hit, tears streaming down my face, was “They got it right!” I could not believe how right they got it. For me, as long as they got it close, it would have been good enough. I would have been ok with a little disappointment as long as they made a good film, because I understand that a film can’t do everything. But there was no disappointment people. They got every single one of the important lines in, plus some lines that totally weren’t in the books but are my new favorites (“Harry talks in his sleep, had you noticed?”)! Neville was a BAMF, Ron was actually quite attractive, and Dumbledore said the line! I was so hurt and yet glad to see Hogwarts, the place I’d come to love, so absolutely defiled. It was as it should have been, and it was so well done that it physically hurt me to see it that way. (I’m also obliged to note that the friend who went with me was extremely excited that they actually redeemed the Malfoys – she’s a huge Draco fan.) Plus, the 19 Years Later scene was incredible! Hats off to the costume/make-up department. And of course, it can’t be a film review from me without a mention of the soundtrack. Despite how involved in the film I was, there were many places that the soundtrack was so well done I just couldn’t help but notice it (plus I’ve been to see it twice now – I always catch more on the second time around). The music was so haunting and empty – matching the way I felt about the last book the first time around – and then the places where they left it silent were perfect as well. I cried just as much because of the beautiful, hurtful music, as the beautiful, hurtful scenes it accompanied. Since today is the final day of our Harry Potter waiting madness, I thought it would be an appropriate day to post the ramblings I wrote just after finishing Melissa Anelli’s Harry, A History. Please keep in mind that the majority of these ramblings were written very late at night a few weeks ago. While they’re not a review, per se, I’m categorizing it as one – for anyone who is confused at the end, I loved the book. Having just finished Harry, A History, I have a lot of Harry related thoughts running around my head. As it is after 1 am and thoughts are not particularly conducive to sleep, I thought I’d share. Firstly, Harry Potter saved my life. I know, we all have our own versions of this story. But picture this: A 9-year-old only child whose only friends are the books she reads has run out of “children’s” books to read. I’m not even exaggerating that much – as someone who grew up with adults I had no idea how to interact with children. I’d been struggling for weeks with incredible boredom. I was lost. This was a huge turning point for me. I can’t even imagine what my life would be like if I hadn’t been introduced to Harry. I can still remember that day – late in fall 1998, before Harry was the Harry Potter, before we even knew J.K. stood for Joanne and not Joseph, when my school librarian suggested it. I ordered the book on inter-library loan and got it within two days (later releases had wait lists more than a year long before the embargo even lifted). I devoured the book in a mere few hours. Suddenly I loved reading again. I would try harder to find books to read. I picked up copies of The Hobbit and The Lion, The Witch and The Wardrobe in the months following, both of which had covers that had previously scared me away. Without Harry Potter, I might have stopped reading altogether and the thought of what that life would be now is just unbearable. Reading Harry, A History was like reliving that time in my life – a time when more magic was waiting just around the corner and when what would happen in the next book was just as important to me as what would happen to me tomorrow. I remember I kept a tally of how many times I re-read the first book inside the front cover – there are at least 10 hash marks now and I stopped counting somwhere around when book 5 came out. I grew up as a part of the Harry Potter generation and it drastically affected my life. Though Harry, A History is not a part of the original 7 books I think it should be required reading for all with an interest in Harry’s story. Part of understanding the love of Harry is understanding the phenomenon. I will certainly be making this book available to my possible future children when they’re old enough to read Harry’s story themselves. My Review: Another High Fantasy YA! I’m loving this new(ish) trend! I have to admit, I’m a sucker for dragons. They are and always have been my favorite mythological beast. (When asked the quintessential “Zombies vs. Unicorns” question, the answer is always Dragons – they can burn the Zombies up before they eat you and their blood, when freely given, is much more magical than Unicorn blood/horns) These dragons have a distinctly oriental feel to them. They follow the Chinese/Japanese zodiac – which I admit I mostly know only through Fruits Basket – and each dragon has certain qualities based on their sign. I found the entire mythology of the dragons extremely intricate, interestingly exotic and just plain fun! Though the basic plotline – girl pretends to be boy to get what she wants – has been done a million times, never has it been done so drastically. Besides that, this classic plot has never had such significant twists and turns based on the simple gender issue. The book raises many questions about the way women and men are viewed stereotypically, both in feudal societies and now. And, like the best novels, it gives no hard and fast answers but allows you to find them yourself. A word to the wise – if you’re not used to the large fantasy tomes like I am, this book may seem a little daunting. Don’t worry. Despite it’s length, I flew through it at nearly twice my normal pace. It is a thoroughly enjoyable book with a good moral and it comes with my highest recommendation. Kate, Michael, and Emma have suffered through ten years of odious orphanage "care"; now they have slipped into the care of the eccentric, disturbingly mysterious Dr. Pym. While exploring their new home, the children discover a magical green book. With that discovery, a decade of tedium dissolves into cascades of dangerous time travel adventures and struggles with a beautiful witch and decidedly less attractive zombielike Screechers. Sometimes the books we love are huge bestsellers we hear about for weeks before they’re published. Then again sometimes we pick something on a whim, based on title, blurb or whatever, just to see. 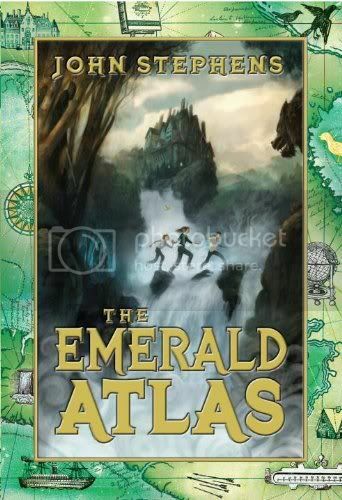 For me The Emerald Atlas was one of the latter. I’m actually really surprised, with so many people doing the Debut Author Challenge, that I haven’t seen one single review of this book yet, good or bad. This is especially surprising considering how much I loved the book! But the thing I love the most, I think, is that there’s someone and something for everyone in this book. Younger readers will identify with Emma and her need to be different from her siblings, while older readers will identify with Kate, who feels a responsibility to protect Michael and Emma, despite their best efforts at getting into trouble. Those of us much older than the intended audience will see the similarities to the novels we grew up with – Harry Potter and His Dark Materials among others – while reveling in the new and interesting ways these tropes have been put together. The point, if you haven’t guessed already, is that this book, and it’s sequels, are books to look forward to, to read and to cherish. Find yourself a copy, if you haven’t already, and help spread the word! Today we have Christine Schulze with us as part of Teen Book Scene‘s Blog Tour. For a full schedule of posts please click here. I’m so excited for her to share with us her top ten playlist of songs she listened to while writing her quartet. Without further ado, I give you Christine! did, just as it influenced The Hero Chronicles. A favorite piece is: http://www.youtube.com/watch? song the Octavial Eight battles Moragon with in The Last Musician and the Pool of Lorelei. Thanks so much for visiting Christine! Readers, keep your eyes open for a review of her book(s) coming soon!